The experimental serum used to treat two U.S. aid workers infected with Ebola is not going to be an option for the patient who is currently battling the virus at a hospital in Dallas. The supply of the drug known as ZMapp ran out in August, and ramping up production is not a quick or easy process. The team that makes the drug is scrambling to meet the sudden, unexpected demand that this outbreak has created. ZMapp was created through collaboration between Mapp Biopharmaceutical, Inc. and LeafBio in San Diego, Calif. and Defyrus Inc., another drug company in Toronto, Canada, with funding from the National Institutes of Health and the Public Health Agency of Canada. ZMapp had never been tried in patients before doses were given to Dr. Kent Brantly and Nancy Writebol in August. 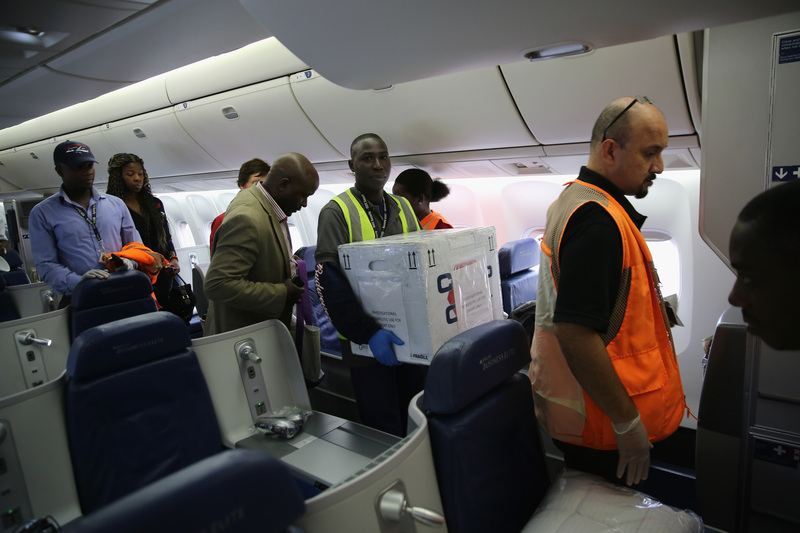 "A year ago no one could really spell Ebola," Dr. Jeffrey D. Turner, president and CEO of Defyrus, told CBS News. "The challenge that many people don't appreciate is that our plans were to scale up this drug for 2015 and even then, small amounts for clinical trials. What's really happened with this outbreak is it's caught us in a position where we didn't have enough ZMapp available because no one would have bought it." Overall, drug research for infectious tropical viruses is severely underfunded. From both a business and scientific standpoint, developing a drug such as ZMapp is less of a priority than using money and resources to find treatments for top killers such as cancer. And as Bloomberg Businessweek recently reported, ZMapp's development was set back by two years spent waiting for funding from a Pentagon program aimed at countering biological threats. Turner said typically, when small biopharmaceutical companies such as his produce an experimental drug for an uncommon disease, they make just a few hundred doses at at time. Before ZMapp was pressed into service on an emergency basis to treat a handful of Ebola patients, it was still in a testing phase and was not being mass produced. "A lot is being produced right now," says Dr. Anthony Fauci, head of the National Institute of Allergy and Infectious Diseases. He told Bob Schieffer on CBS News' "Face the Nation," "It should be ready in a month and a half, two months. We're not going to get it tomorrow or next week." Dr. Kartik Chandran, associate professor of microbiology and immunology at Albert Einstein College of Medicine, told CBS News it would be possible to find other ways to make ZMapp, such as growing cell cultures in bio-reactor tanks, but he cautions this could backfire. "The problem is that you have to engineer the right cells, you have to do a bunch of testing," he said. "If they're starting from the beginning, that's going to take longer." He added that speeding up production for an emergency response could make errors more likely and might sacrifice decades of research. ZMapp is a combination of three different monoclonal antibodies that bond to the glycoproteins of the virus. "You're stapling the viral glycoprotein in three different places with these antibodies," said Chandran, who has spent a decade studying how the Ebola virus behaves on a cellular level. "The idea of using antibodies to treat infections is really old." Manufacturing drugs from biological sources to create an antibody cocktail has allowed for the production of blockbusters medications such as Herceptin, a drug that's become a first-line treatment for certain breast cancers. This type of treatment is also the reason why millions of HIV-positive patients are alive today. Chandran said there still much to learn about how ZMapp actually works, before it can be counted on as an effective therapy for the deadly outbreak in West Africa. In August, the American aid workers Brantly and Writebol each received several doses of the drug and survived. However, experts and health officials say it's impossible to know for sure whether ZMapp saved their lives, or whether both were simply statistically lucky and recovered with the help of high-level supportive care provided at Emory University Hospital in Atlanta. A Spanish missionary priest who also received ZMapp this summer did not survive. The drug has been found to work effectively in several animal studies. In one study, published in August in the journal Nature, researchers successfully cured 18 monkeys of the Ebola virus by administering ZMapp three to five days after they were exposed to the virus and when they were exhibiting symptoms. A randomized controlled trial in people -- the only way to thoroughly test the drug -- has yet to be conducted, which is why the usefulness of ZMapp is still up for debate. "We need to understand exactly why ZMapp is so potent," said Chandran.